Hluhluwe River Lodge and Adventures offers guests comfortable yet elegant KwaZulu-Natal safari lodge in South Africa. Situated on the western coast of Lake St Lucia, this KwaZulu-Natal safari lodge provides the perfect opportunity to access the World Heritage Site on a slow boat cruise along the shoreline. During the cruise, guests will learn more about Lake St Lucia's habitat. Hluhluwe River Lodge and Adventures accommodates guests staying at this KwaZulu-Natal safari lodge in luxurious thatched chalets dotted along an indigenous garden. 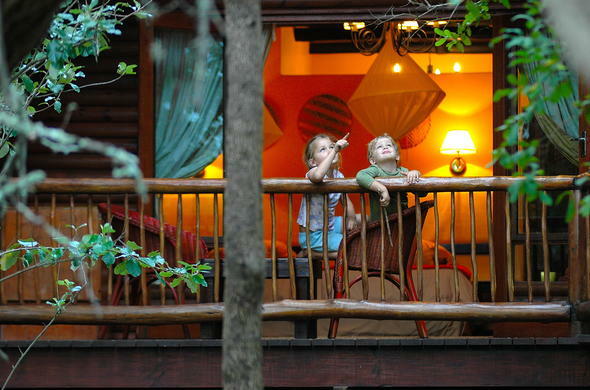 Each chalet features its own viewing deck and is fully air-conditioned, ensuring a comfortable stay. Enjoy an exciting Big Five safari in Hluhluwe Imfolozi Park. Alternatively, join a bird watching river cruise along the Hluhluwe River. Guests can also participate in a range of activities available at this KwaZulu-Natal safari lodge, such as an Eco quad trail and mountain biking.